“Dream Teams” are usually characterized by their success and performance. The United States Olympic basketball team was heralded as such in 1992, and subsequent teams have been ascribed that moniker as well. Combined they have medaled in all 16 international competitions they’ve competed in, including 13 gold medals. Dream teams are expected to perform. 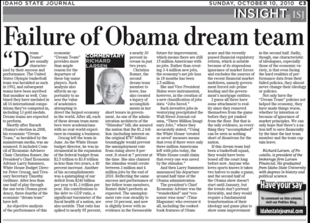 Shortly after Barack Obama’s election in 2008 his economic “Dream Team,” as heralded by the mainstream media, was announced. It included Council of Economic Advisers Chair Christina Romer, the President’s Chief Economic Advisor Larry Summers, White House Budget Director Peter Orszag, and Treasury Secretary Timothy Geithner. After less than one half of play through the one term Obama presidency, three-fourths of the economic “dream team” have left. An objective analysis of the performance of this economic “Dream Team” provides more than ample reason for the departure of these big-name players. Such analysis also affords an opportunity to assess the value of academics attempting to direct the largest economy in the world. After all, each of these dream team members were academicians with no real world experience in running a business. Orszag left the team in June. As the White House Budget Director, he was instrumental in the expansion of the federal budget from $2.5 trillion to $3.8 trillion in less than two years, a 40% increase. Another of his accomplishments was a quintupling of our deficit from $240 billion per year to $1.3 trillion per year. His contributions to the debt-to-GDP ratio, a significant barometer of the fiscal health of a nation, are also notable. That ratio has spiked to nearly 95%, a nearly 30% increase in just two years. Christina Romer, the second dream team member to leave, has also created a legacy of accomplishments in her short tenure in government. As one of the administration architects of the “Stimulus” bill, she assured the nation that the $1.2 trillion (including interest on the original $787 billion) boondoggle would prevent the unemployment rate from rising above 8%. It stood at 7% at the time. She also claimed the stimulus would create between 3 million and 4 million jobs by the end of 2010. Reflecting the same success and performance of her fellow team members, Romer didn’t perform as expected. The unemployment rate rose steadily to over 10%, and now is slightly lower with no evidence in the foreseeable future for improvement, which means there are still 15 million Americans with no job. Rather than creating 3-4 million new jobs, the economy net job loss in 18 months has been 2.5 million. And then Larry Summers announced his departure around half-time of the Obama administration. The president’s Chief Economic Adviser was the “wunderkind” and “economic wise man” (Time Magazine) who oversaw it all, including the cooked-book features of Obamacare and the recently passed financial regulatory reform which is notable because of its stupendous ignorance of market forces and excludes the sources of the recent financial market meltdown, namely government forced sub-prime lending and the government’s mortgage entities. I guess all three have some attachment to reality since they removed themselves from the game before they got yanked from the floor. But that is the only evidence, as everything they “accomplished” can be seen as nothing short of disastrous for the nation. If this dream team had been a basketball squad, they would have been booed off the court long before now. Anyone who loves sports knows it takes two halves to make a game, and the second half of the Obama show doesn’t start until January, but the trends don’t portend favorably, and they would require a fundamental transformation of their ideology and game plan to show some improvement in the second half. Sadly, though, one characteristic of ideologues, especially those of the economic variety, is that even facing the hard realities of performance data from their failed policies, they almost never change their ideology or policies. Not only have the “Dream Team” policies not helped the economy they have made things worse, whether by intention or because of ignorance of market principles. We can only hope that there’s a nation left to save financially by the time the last team member and the team captain leave.